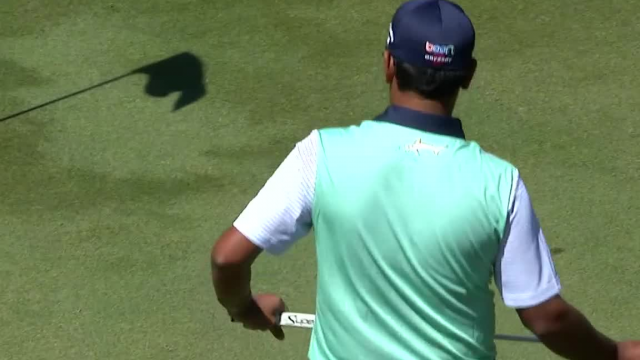 In the second round of the 2019 Valspar Championship, Anirban Lahiri rolls in a 23-foot putt from the fringe to make birdie at the par-4 10th hole. In his second round foursomes match in the 2018 ISPS Handa Melbourne World Cup of Golf, Anirban Lahiri sinks a birdie putt on the par-4 13th hole. In his second round foursomes match in the 2018 ISPS Handa Melbourne World Cup of Golf, Anirban Lahiri sinks a birdie putt on the par-4 1st hole. In his opening round four-ball match in the 2018 ISPS Handa Melbourne World Cup of Golf, Anirban Lahiri sinks a birdie putt on the par-4 18th hole.